Almost 400 Greater Famingos, who came from Siberia after covering thousands of miles to breed in the warm marches of the Khadir region in Kutch have been electrocuted to death as reported by the TOI today. Although the Official counting stood at 130, the locals estimated the death to be much more than that. 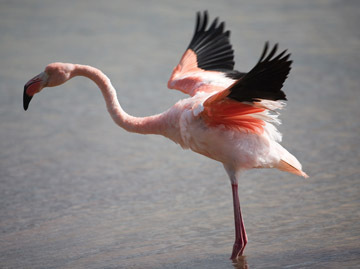 Mostly, the death takes place during dark, when the Flamingos are forced to fly due to passing vehicles. The birds fly directly into the cables and get electrocuted. Harriers also contribute to the killings by creating a flutter within the Flamingos, forcing to fly abruptly and many go diretly into the cables. The Centre for Desert and Ocean had recommended for rubber insulated cables instead which has been reiterated by the Forest Department which has opined for either insulation or underground installation of the cables. The matter may be moved further if organisations like Greenpeace takes up the issue. This entry was posted on Thursday, December 1st, 2011 at 6:09 am	and is filed under General, Wild Life. You can follow any responses to this entry through the RSS 2.0 feed. You can leave a response, or trackback from your own site.